Berlin is the world capital of music, cinema, art and fashion, but also for a modern- architectural complex which recreates the dramatic story of all the history of Germany in particular. The story on the streets of Berlin is alive mostly due to the symbolizing Iron Curtain Berlin Wall with the undisputed symbol of Berlin and in general the whole of Germany - Brandenburg Gate. This magnificent monument is something like the German triumphal arch. 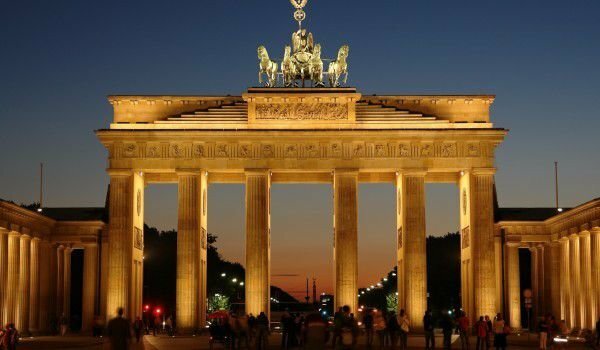 Brandenburg Gate was once called "the gate of the world." It is the only preserved by the so-called city gates of Berlin. The construction of this emblem of Berlin began in 1789 and graduated in 1791. The project architect was Carl Langans, whom decided to raise its creation in the classicism style. The façade, decoration and arrangement were made by Johann Schadov that designs the 6-foot quadriga operated by the Roman goddess of Victory, Victoria form of a triumphal crown. After the victory of Prussia over Napoleon Bonaparte during the Napoleonic Wars Brandenburg Gate was seriously "adversely affected" by interference from the French emperor. Napoleon ordered to disassemble the triumphal crown and for it to be transferred to Paris. After the Battle of Leipzig and the dethronement of Napoleon who was exiled on the island of Elba, and after the French defeat at the Battle of Waterloo, the triumphal crown was returned back to Berlin in 1814. Triumph crown of the Brandenburg Gate has been changed by a Roman eagle of Karl Schinkel, instead of an olive branch in the hand of Victoria. During the Battle of Berlin at the end of World War II in Europe, the Brandenburg Gate again suffered serious damage, then the arch was fully restored in 1956. 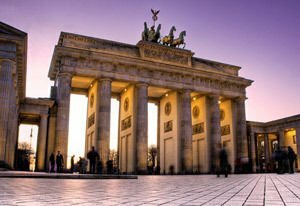 Brandenburg Gate reaches a height of 26 meters, a width of 65.5 meters, and its depth is measured at 11 feet. On November 9th, 1989, exactly 200 years after the start of construction of the door, the Berlin Wall, symbolizing the Iron Curtain fell, and with that comes the end of the Cold War. After that time anyone may pass through the Brandenburg Gate. Brandenburg Gate throughout the 20th century and the last 20 years has become an arena of major events. After the victory in the Franco-Prussian War, the Army of the fusion of Germany, Otto von Bismarck manifests a triumphant return from Paris under the Brandenburg Gate. After the arrival of the National Socialist Party to power in Germany in 1933, under the arch area was the scene of an outburst of nationalist enthusiasm.